August 21, 2014 | by Darcy Blake | I’m in love with a pretzel. Never thought much about them until I met Heidi Rosenberg, the amazing founder of Pretzels for Parkinson’s! When I heard about her mission to “Crunch for a Cure” I bit! They educate people on the debilitating Parkinson’s disease (PD), and also provide a yummy treat to raise money for further research. Her three boys had been dipping pretzel rods in melted chocolate and then twirling them in little candies for years calling them “magic wands”! They brought them to bake sales, birthday parties, sporting events, holiday celebrations and anywhere the kids could have an excuse to indulge in some chocolate magic! “Pretzels for Parkinson’s” was born! Their mission is to spread their “Crunch for a Cure” motto with the intention of finding a cure for Nini and the millions like her who struggle every day! The “Pretzels with a Purpose” idea has since exploded! 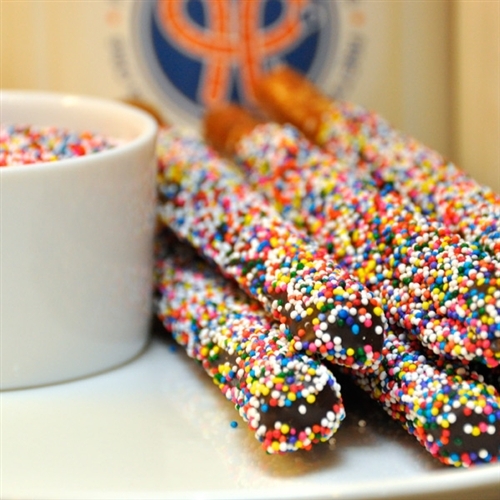 They have partnered with a famous Chocolatier to produce their high quality, handmade chocolate covered pretzel rods and ship them around the world! New flavor combinations appear throughout the year (specialty candy toppings, cookie toppings and more!) You can follow them on Facebook and Twitter and even submit your own confection combination ideas!